What does gluten have to do with your teeth? Celiac Disease is an autoimmune disease, not a food allergy, which affects infants, children, and adults and results in a permanent intolerance to gluten - a protein found in wheat, rye, and barley. The enamel defects range from slight defects in the color of enamel, with white, yellow, or brown opacities (spots), rough enamel, horizontal grooves, large vertical pits all the way to severe structural defects, with possible total loss of enamel (enamel hypoplasia). Other causes of enamel defects are vitamin D deficiency, premature birth, dental fluorosis, trauma, localized infection, and the use of antibiotics. 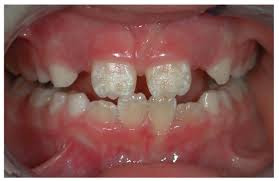 Enamel defects are an important early indication that the child may suffer from Celiac Disease and is a non-invasive way for dentists to diagnose the condition in those with suspected disease, and should be a part of every oral examination - yet another good reason to have a dental exam by Dr. Geisler, a Plymouth, MN dentist. We offer gluten-free dentistry at Life Smiles. Also Read : Love your metal fillings?